When you’re a Marine and your job deals with bomb disposal, death is always close at hand. For many spouses of EOD (Explosive Ordnance Disposal) warriors, danger and uncertainty become permanent members of the household. The stress and worry can take a toll on a relationship, to say the least. 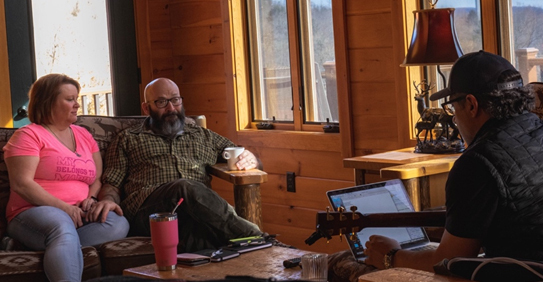 “EOD stands for ‘Every One’s Divorced,” joked a spouse at the recent SongwritingWith:Soldiers retreat for EOD couples at Boulder Crest Virginia. Humor proved to be a frequent salve for the six couples who attended, all seeking something rare in their lives – a chance to relax and reconnect with each other. Four of the couples were still active duty, (one within weeks of returning home from deployment). Two couples, including Kelly and Judy, shown below, were recently retired. “He’s turning 50 tomorrow,” Judy said, pointing to her husband Kelly, a US Marine who served for 30 years. “Some birthday,” he chuckled. His firm gaze revealed a combination of reluctance and high expectation. ‘This better be worth it,’ it seemed to say. Within hours, Kelly and Judy were tossing out words and phrases that ended up in a quick group song written Friday night called, “Whiskey,” a humorous take on tackling daily stresses. Tensions eased a bit. Creative wheels set in motion. On Saturday morning, after braving a beginners’ yoga class, Kelly and Judy spent 2 hours describing their military life experiences with songwriter, Jay Clementi. By lunch, the three had wrapped the stories and Kelly’s deep love for Judy into a song, “Too Stubborn to Quit”. Along with that rare gift, Kelly was surprised after dinner with a fully lit cake and rowdy “Happy Birthday” sung by all. The 50 flames disappeared with one swift blow. (Do they train for that in EOD school?). 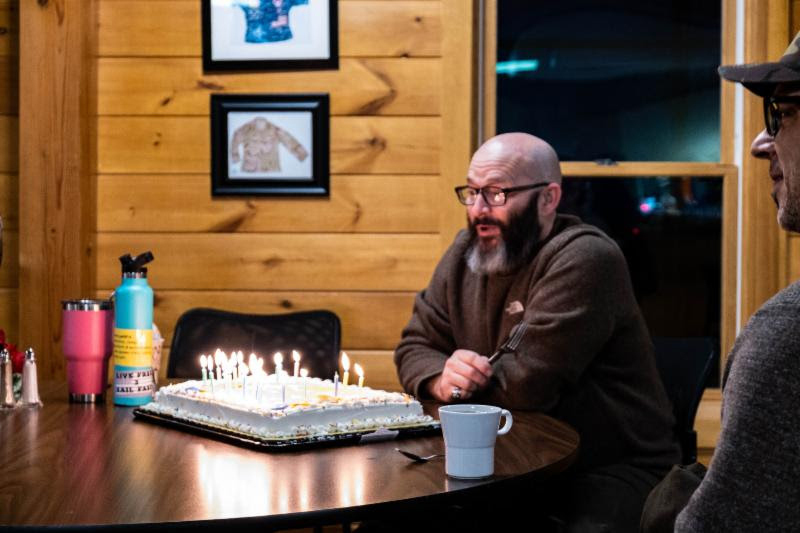 The beauty of watching a retired Marine — charged with diffusing explosives — blow out 50 birthday candles was not lost on anyone. Kelly sat front and center for the evening concert where his song and those of the five other couples were performed for the first time. Song after song, hands were held. Tears shed. Hearty laughs shared. And, countless, knowing nods traveled across the room, revealing the new bonds that were forming – I hear you. We’ve been through that. I feel that way, too. The usual danger, unpredictability, distance so familiar to these couples was in a very different place. What a gift to be able to provide them with the space for peace, reconnecting and creating something new, together.